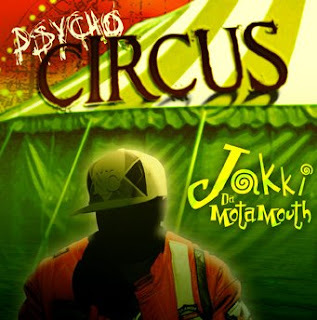 After his strong debut album "God vs Satan", released on Babygrande records back in 2005, veteran battle rapper and ex-member of the classic hip-hop group the ''Mhz'', Jakki Da Motamouth is back again, independently this time, with his new sophmore album ''Psycho Circus''. A conceptual record, the theme is set in a circus enviornment where he has devised his own roller coaster like ride. The point of which, to explore the different regions of his brain, and reveal the positive and negative thoughts and visions that ultimately fight for his sanity. Although it can be dramatic at times, there's also a hint of humor on the record as well that lightens the mood. Guest spots by Copywrite and up and coming rappers Shattastar, Flip (aka Gritty Nitty), and Grimm Diabolic make this album a wonderful balance of comedy, raw lyrics, and colorful stories that almost always end with a twist! With production handled by Walter Rocktight, Copywrite, and Grimm Diabolic, this album is sure to be a 4th quarter 2008 banger!